Do you go out for New Year’s Eve or do you host a small family party at home? Are you able to stay up until midnight or are you snoring before the ball drops in Times Square? Here are a few ideas for free printable New Year’s Games that the whole family can enjoy. Simply scroll down for the links to these free printable games. The first is a New Year’s Eve Word Scramble. We’ve scrambled 10 words commonly related to New Year’s Eve. Simply print this free printable game for your kids and have them solve the puzzle. The answers have been included on the bottom of the free printable. 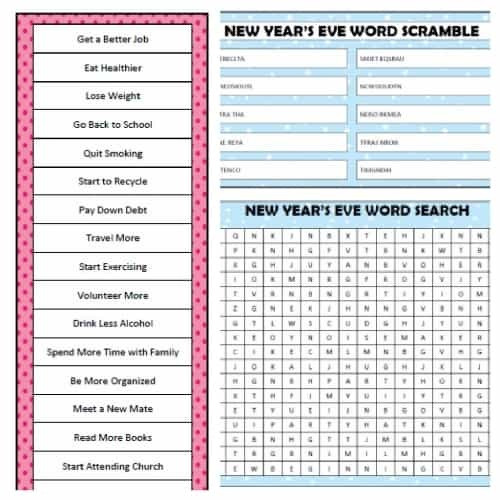 The second is a New Year’s Eve Word Search. The words to search for are the same words used in the word scramble so if your kids will be playing both games, you’ll want to have them do the word scramble first. Simply print the free printable game and have your kids search for the hidden words and highlight them. 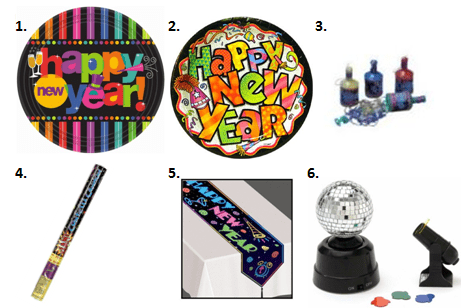 The final New Year’s game is a New Year’s Eve Resolution Charades game. This game is more interactive than the word search and word scramble. All of these charades are resolutions commonly made by people on New Year’s Eve. Simply print the free printable and cut out the charades. You can remove any that you don’t think your kids could act out. Place the charades in a bucket and have both teams take turns selecting an actor and a charade to act out. If your team correctly guesses the right charade, you get one point. If your team does not guess the correct charade, the other team gets one chance to guess the charade to earn one point. Do you ever make resolutions for a new year? If so, do you have troubles sticking to them? Looking for more fun New Year’s games? Check out our Holiday Fun page and scroll to the New Year’s section under the January heading. We’re always adding new ideas for celebrating holidays with your family. Stay updated on the latest ideas by following us on Facebook, Twitter, Pinterest and Bloglovin’. *Digital paper by Pixel Paper Prints. I am part of the Amazon affiliate program. All opinions expressed here are my own. These look like a lot of fun! We like to stay home for New Year’s so it’s nice to have some fun things to do 🙂 I personally don’t make New Year’s resolutions…. Thanks for doing all the work for me!! We love charades and these are perfect! Every year I’m on the hunt for games, thanks for these! Ohhh So much fun! I am so excited to use these! Thank you so much! I love new games and ideas for holidays!